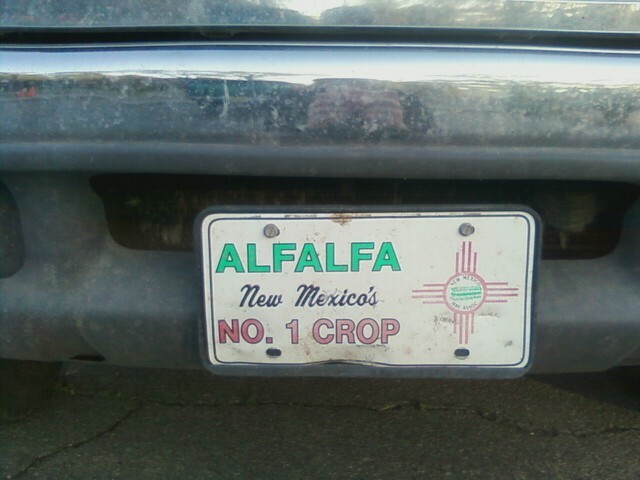 It was just too perfect because we jokingly refer to the sort of work I was doing in New Mexico as “harvesting ALFALFA”, so of course I whipped out my cell phone to take the picture above. The ALFALFA survey is nearing completion which means we’re starting on the next phase (harvesting ALFALFA) – following up on all the intriguing sources found by ALFALFA. The recent posts from the Undergraduate ALFALFA Team detail part of that effort – confirming detections using the L-Band Wide (LBW) receiver at Arecibo. This is only part of effort to understand the interesting sources. ALFALFA is great for finding galaxies based on their gas content and figuring out which galaxies are unusual, and hence interesting. Unfortunately, we don’t get any information about the distribution of gas within a galaxy from ALFALFA; the “beam” (or resolving unit) of the Arecibo telescope is larger than the galaxies we observe. This means that if we want to localize and understand the gas within galaxies we need a larger telescope since larger telescopes have smaller beam sizes. It’s not physically feasible to build a single telescope that is large enough to resolve structure on the scales astronomers are interested in – it would need to be a kilometre or more across! Instead, individual telescopes spread out over those distances work together to function as a single telescope. This is called interferometry and I’ve describe the idea behind it in more detail before. One important aspect of interferometry is that it’s not easy – combining the data from the individual telescopes together to create a single image is tricky (and figuring it out was worth a Nobel prize!). The main reason I was in Socorro was to get help from experts and figure out the secret tips and tricks for making the best images. That way, as we find more and more sources from ALFALFA that we want to “harvest” with the JVLA we can have a strategy in place for dealing with the data calibration, imaging and analysis, just like we have a method in place for handling ALFALFA data. I’d like to explain those general steps one day, but for now I’m still working on figuring it out!